Broad rolling bottomlands laced with lazy oak-lined rivers characterize this most-altered of the state’s bioregions. Once vast tule marshes sent up thick clouds of waterfowl while immense herds of elk, pronghorn antelope and other grazers crowded the grasslands; today only remnants of that landscape remain. The Central Valley bioregion is the state’s top agricultural region. 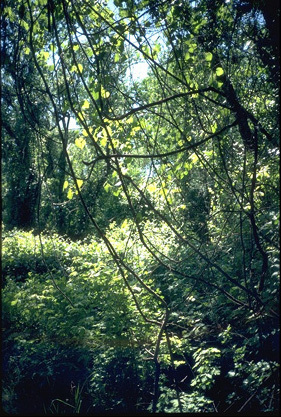 Ecosystems range from oak woodlands and grasslands to riparian forests. 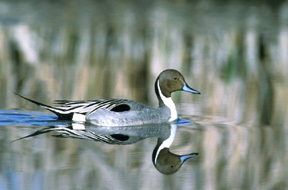 Vernal pools and freshwater marshes provide habitat for rare plants such as Mason’s lilaeopsis, San Joaquin woollythreads and California hibiscus. In the northern part of the bioregion, summer hot spells are relieved by the Delta breezes, which carry moist air from the San Francisco Bay eastward through the Delta and into the Sacramento area. Autumns are mild and end abruptly with the coming of the winter fog, usually in late November. The "tule" fog blankets the valley from late November until February, keeping temperatures chilled. Rainfall ordinarily is frequent in winter, but snowfall is unusual because temperatures do not dip low enough. The southern part of this bioregion is hot and dry in summer with long, sunny days. Winters are damp and the landscape is often blanketed in a heavy fog. The northern portion of this bioregion is flat for the most part, though the Sacramento-San Joaquin River Delta has some hills, along with its freshwater marshes. The region is bordered by the coastal range foothills to the west, the snow-capped peaks of the Sierra Nevada to the east and the Tehachapi Range to the south. Two major rivers– the Sacramento and the American– carry water that originates in the Sierra Nevada south and west into the Delta. The Central Valley bioregion is the focus of much debate because of the conflicting demands on its water resources. Other rivers in the northern part of the bioregion include the Cosumnes, lower Feather, Bear, and Yuba rivers. The region is home to the state capital, Sacramento. The southern portion of this bioregion is a broad, flat valley. Habitat includes vernal pools, valley sink scrub and saltbush, freshwater marsh, grasslands, arid plains, orchards, and oak savannah. The growth of agriculture means that much of what was once native grassland, woodland, and wetland is now farmland. The major river is the San Joaquin; tributaries of the lower Stanislaus, Tuolumne, Merced, and Fresno rivers also flow through the area. Riparian forest. Photo courtesy of Marc Hoshovsky, California Dept. of Fish and Game. The California Aqueduct runs through this part of the bioregion, as do the Kings, Kaweah, and Kern rivers. About one-fifth of the state’s remaining cottonwood and willow riparian forests are found along the Kern River in the South Fork Wildlife Area. Water– Water conservation is a critical issue in this region, which is one of the fastest-growing in the state. Increasing development means less water for the area’s huge agricultural industry and reduces water levels in the region’s rivers, threatening fish populations. Disappearing farmland and habitat– Rampant development around towns such as Sacramento each year covers up vast tracts of some of the world’s richest farmland. Development and industrial agriculture also are fast wiping out the dwindling riparian oak forests, which harbor rare valley, blue and Engelmann oaks.